Every year at the time of Eidal-Adhaa and Hajj, we recount the story of Ibraheem and Isma'el`alayhimussalaam. Their lives were permeated with the Love of Allah Subhaanahu wa Ta'aalaa and with dedication to His service and obedience. They loved and obeyed Allah Subhaanahu wa Ta`aala to such a level of perfection that Allah presented them as model Muslims, the way every Muslim should be. Their lifestyle is not only a perfect model of Submission to Allah Subhaanahu wa Ta`aala but also a beautiful example of an ideal parent-child understanding without any generation gap. There are many lessons we should learn from their story, but for the sake of brevity, we will concentrate only on the episode of sacrifice. As you know, Ibraheem was born in a society where many false gods such as idols, stars, planets and moons were being worshipped and offerings were made to them. Animals and even humans were sacrificed to keep those false gods happy. Ibraheem `alayhissalaam had dedicated his life to call people to abandon false gods and only believe in Allah Subhaanahu wa Ta`aala, the One and Only Creator. The sole mission of his life was to bring the message of Islam (complete obedience to Allah in every aspect of one’s life) to all people around him. His objective, like every other prophet and messenger, was to call people to submit in obedience to Allah Subhaanahu wa Ta`aala and to establish an Islamic society – a political entity where majority of people were dedicated Muslims and that society of Muslims was a model of peace, love, caring, sharing, fairness, justice, generosity, human equality, dignity, balance and moderation. His people rejected his call completely and decided to kill him by throwing him into the burning fire from which Allah Subhaanahu wa Ta`aala saved him. Now it was evident that he could not live among those people and carry out his mission. He did not know where to go, but he departed with faith and trust in Allah Subhaanahu wa Ta`aala He had grown old working tirelessly for that purpose and felt a need for someone to carry on this mission of love – inviting people to true Islam and establishing a Muslim-majority Islamic state consisting of those who accept the invitation. This goal gave him a strong desire for a son who could continue his mission. After a lot of Du`aa (supplications), Allah Subhaanahu wa Ta`aala granted him a son when he was extremely old (86 years according to the Bible). (1) He was named Isma'el (which meant: Allah has heard) because Allah Subhaanahu wa Ta`aala had listened to the Du`aa of Ibraheem`alayhissalaam. This son, Isma'el, was Ibraheem`alayhissalaam’s dearest and most beloved asset in this world. When Isma'el`alayhissalaam was about thirteen (Ibraheem being 99), Allah Subhaanahu wa Ta`aala decided to test their faith in and submission to Allah in public (2). Both father and son were put through the most difficult test of their love for Allah. Ibraheem `alayhissalaam saw in a dream that he was sacrificing Isma'el – an unimaginable act – sacrificing the son he begot after so much Du`aa, the only one he had and the one who had been the centre of his affection and love for all these years. Ibraheem `alayhissalaam knew that the dreams of the prophets were inspired by Allah. They were one of the ways Allah Subhaanahu wa Ta'aaa communicated with his prophets. This must be what Allah wanted him to do. When the intent of the dream became clear to him, Ibraheem`alayhissalaam decided to offer his beloved son in sacrifice. Although it would be easier for him to give his own life rather than take his son’s, he willingly surrendered to the perceived commandment. To him, as to any Muslim, the love for Allah Subhaanahu wa Ta`aala must always be supreme and strongest. Every other love must be subservient to the love of Allah Subhaanahu wa Ta`aala, hence sacrificeable for His sake. Although Ibraheem `alayhissalaam was ready to sacrifice his dearest for Allah’s sake, he could not just go and drag his son to the place of sacrifice without his consent. Isma'el had to be consulted as to whether he was willing to die for Allah Subhaanahu wa Ta`aala. This consultation would be a test of Isma'el’s maturity in faith, love for Allah, Islamic commitment, willingness to sacrifice his life for the sake of Allah and parent’s obedience. It would also be a test of how well Ibraheem had been able to train his son in Islam and how close or apart were the two Muslims of different generations in their thinking, approach and attitude. Ibraheem `alayhissalaam presented the matter to his son and asked for his opinion about the dreams of slaughtering him. Isma'el’s reaction was absolutely astounding. He did not show any hesitation or reservation even for a moment. He said, “Father, proceed ahead for what you have been commanded. You will find me, Inshaa Allah, very patient.” His mature response, his insight into the nature of dad’s dreams, his willingness to sacrifice his life for the sake of Allah and commitment to Allah’s submission were all unparalleled. The most amazing and noteworthy, however, was the perfect coherence and unity of thought, attitude and outlook between the father and the son. We do not see any generation gap between the two because both of them were looking at life through an Islamic paradigm – that a Muslim must submit to Allah Subhaanahu wa Ta'aala in any circumstances and that love for Allah is over and above any other love in the life of a Muslim. When both father and son had shown their perfect obedience to Allah and they had practically demonstrated their willingness to sacrifice their most precious possessions for His sake -- Ibraheem `alayhissalaam by laying down his son for sacrifice and Isma'el by lying patiently under the knife – Allah Subhaanahu wa Ta`aala saved Isma'el and replaced him with a ram. Allah Subhaanahu wa Ta`aala also told them that they had passed the test with flying colours and that they had fulfilled what Ibraheem `alayhissalaam was shown in the dream. According to the Bible, the good news about Is-haaq was given when Ibraheem was 99 years old and Is-haaq (Isaac) was born when Ibraheem was 100 years old (3). However, the Bible omits the mention of the sacrifice at that time and only mentions circumcision of Ibraheem and Isma'el `alayhimussalam (4). The Holy Qur-aan clarifies the reality that it was a tremendous demonstration of submission to Allah Subhaanahu wa Ta`aala in the form of sacrifice, not a small thing like circumcision that pleased Allah so much that He miraculously bestowed Ibraheem `alayhissalaam another son despite the fact that he and Sarah both had long passed their normal child bearing age and Sarah was barren all her life (5). The One True God does not expect people to offer ritual human sacrifices. People lose their life to ritual sacrifice only because of the falsehood created by those who promote false gods. Allah Subhaanahu wa Ta`aala loved their example of total dedication and devotion to His commandment so much that He made it incumbent on all Muslims until the Day of Judgment to commemorate Ibraheem’s and Isma'el’s `alayhimussalaam spirit of complete submission to Allah through a yearly celebration of their sacrifice. The major purpose is that the Muslims can refresh, understand and internalize the full implications of claiming to be ‘Muslims’ (i.e. obedience to Allah) by simulating the act of sacrifice devotedly performed by Ibraheem and Isma'el`alayhimussalaam. A properly practicing Muslim family does not encounter a generation gap between different generations of Muslims. A gap between two generations is caused only by the presence of un-Islamic behaviours or attitudes in either of the generations or both. Eidal-Adhaa is not merely an occasion of ritual celebrations, but an annual tune-up of one’s lifestyle so that it becomes a lifestyle that is totally submerged in submission to Allah Subhaanahu wa Ta`aala. It is a celebration of simulating a Muslim’s readiness to sacrifice everything for the sake of Allah. May Allah Subhaanahu wa Ta'aala grant us the strength of spirit and will to perfectly emulate the examples of Ibraheem and Isma'el`alayhimussalaam in every facet of our daily struggle to become better Muslims, Inshaa Allah. Who was Offered for Sacrifice – Isma'el or Is-haaq? Ibraheem`alayhissalaam’s son who was offered for sacrifice and whose sacrifice was accepted without being killed was very special in terms of Allah’s promise of blessings on him and his descendents as well as in terms of honour and closeness to Allah Subhaanahu wa Ta`aala. This special honour for the son and his descendents has created two differing claims as to the identity of the son who was offered for sacrifice. The Muslims believe that the son whom Ibraheem`alayhissalaam offered for sacrifice was Isma'el`alayhissalaam, while the Jewish traditions claim that it was Is-haaq. As the sequence of events has demonstrated in the Festival of Sacrifice article, the Holy Qur-aan makes it abundantly clear that the son who was offered for sacrifice was the first-born, Isma'el (Ishmael)`alayhissalaam. The second son, Is-haaq (Isaac)`alayhissalaam, was born miraculously as a reward for the acceptance of the sacrifice from Ibraheem and Isma'el`alayhimussalaam. 1. An outstanding quality mentioned for Isma'el`alayhissalaam in the Holy Qur-aan is that he was true to his promise, because he willingly presented himself for sacrifice and promised to be patient and steadfast. He was true to his word and willingly lay down to be slaughtered. None of the distinguishing attributes of the son offered for sacrifice have been attributed to Is-haaq `alayhissalaam as his special qualities either in the Qur-aan or in the Bible. The Holy Qur-aan attributes them as distinguishing qualities only to Isma'el `alayhissalaam. One may ask why the Holy Qur-aan has not clearly mentioned Isma'el`alayhissalaam’s name? 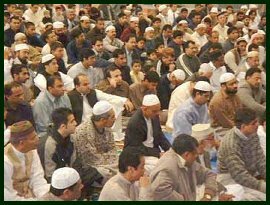 The style of the Holy Qur-aan is that it does not mention anything that is clear from the text and is well known in the society. From the text and the order of the verses the fact was evident that the son who was offered for sacrifice was the first born and that the second son was born only after the sacrifice episode. Similarly, in Arabian society, the presentation of Isma'el `alayhissalaam for sacrifice was well known and accepted. So much so that every year without fail Arabs used to present sacrifices in remembrance of Isma'el’s sacrifice. Hence to mention something that obvious was against the concise style of the Qur-aan. Had it not been Isma'el, the first born who was given in answer to prayers, then the name would have definitely been mentioned. No mention of the name is evidence in itself that it was Isma'el`alayhissalaam. When many Jews and Christians became Muslims, some of them brought their knowledge and impressions about the previous Biblical personalities along with them and starting spreading those ideas among Muslims as well. When that kind of information started circulating among Muslims, it created confusions in the minds of some Muslims as well. But, there is a slight problem with this statement in the Bible. According to the Bible itself when Isaac`alayhissalaam was born, Ibraheem `alayhissalaam already had a 14-year-old son, Isma'el `alayhissalaam. So, if the son who was offered for sacrifice was ‘the only son’, it cannot be Isaac because Isaac was never an only son even for one day. It has to be Isma'el who was ‘the only son’ for 14 years. “And Abraham said unto God, O that Ishmael might live before thee!” (Genesis 17:19) (i.e., he lives under the kind, blessed and protective sight of Allah). If Ibraheem`alayhissalaam was already told that Isaac `alayhissalaam’s descendents will have covenant with Allah Subhaanahu wa Ta'aala, how could Allah then test Ibraheem`alayhissalaam by asking for his sacrifice, considering also that episode of sacrifice happened long before the son offered for sacrifice could be married or have children? Also, the place where episode of sacrifice took place was Marwah – a hillock besides the house of Allah in Makkah, which in the Bible was misspelled and pronounced as Moriah, of which name there has been no place. Even if, for the sake of argument, we set aside every other evidence, the strongest evidence comes from the history, practices and traditions of Jews and Arabs. It is a well-known fact that Jewish customs and practices have been largely determined by the lifestyle of their patriarchs. They circumcise their children because Ibraheem`alayhissalaam did; they do not eat the meat from the hind of an animal because of an incident that occurred when Jacob`alayhissalaam wrestled with God; they do not eat anything that Jacob did not eat for his own personal reasons, etc. Surprisingly, their whole history is devoid of any practice of sacrifice in remembrance of Ibraheem`alayhissalaam’s offering his son for sacrifice. On the other hand, since the day Isma'el was offered as sacrifice, Arabs have been offering sacrifice of animals in commemoration of the sacrifice of their great grandfather, Isma'el, at the same place where and on the same day of the year when the original sacrifice happened. That had continued throughout their history every year without fail until the advent of Muhammad Sall Allahu`alayhi wa sallam and has continued since then among Muslims without any break. It is reported that even the horns of the Ram that replaced Isma'el`alayhissalaam were preserved in the Holy Ka’bah but were lost when the building of Ka’bah collapsed during the army action by Hajjaaj bin Yousuf. Labbayk, Allahumma Labbayk. Here I am, O Allah, here I am. And when Abram was ninety years old and nine, the LORD appeared to Abram, and said unto him, I [am] the Almighty God; walk before me, and be thou perfect. upon his face, and laughed, and said in his heart, shall (a child) be born unto him that is a hundred years old? And shall Sarah, that is ninety years old, bears? One example of improper narration is that it gives the impression that Ibraheem deceived his son instead of becoming upfront about it. It is also mentioned in the Holy Qur-aan: And his wife was standing (by), so she laughed, then We gave her the good news of Is-haaq and, after Is-haaq, of Ya’qoob.